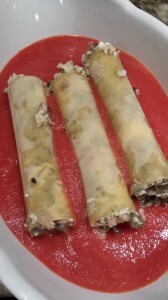 Chicken Pesto Sausage Stuffed Cannelloni. 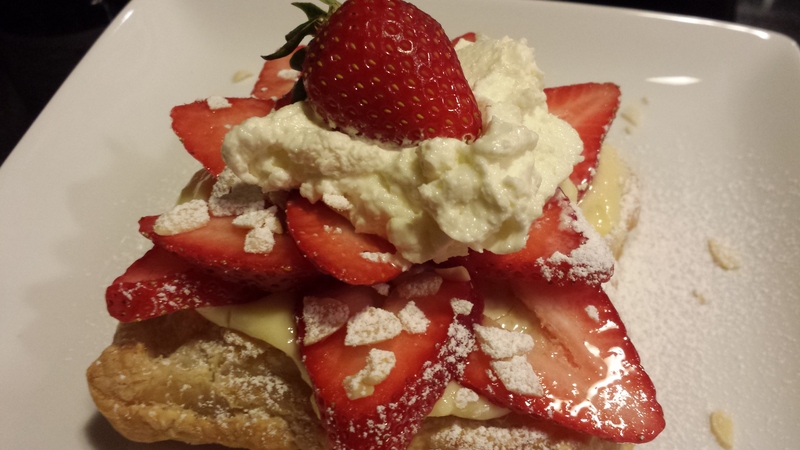 In creating delicious dishes, many times I use whatever ingredients that I have on hand. A while back, I bought Trader Joe’s Sweet Basil Pesto Sausage to use on a pizza. That sausage was very tasty so I bought another package. 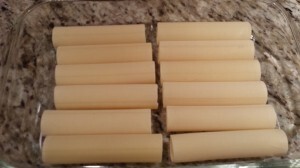 Going through the pantry, I came across some cannelloni shells. 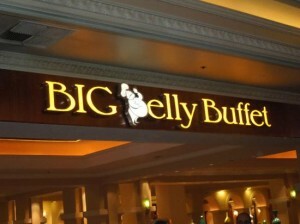 Hmmmm, what about combining the two into a scrumptious baked stuffed pasta dish? 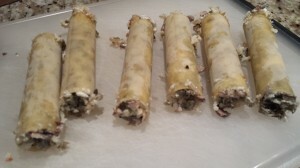 My Chicken Pesto Sausage Stuffed Cannelloni was born! This is a favorite Saturday night pasta dish. Serve with a side salad and some garlic bread. I like to use pre-made dry cannelloni shells. Try this brand, or your favorite brand, or make your own. You can make this dish in a large glass baking pan, or in individual baking dishes. I prefer to use individual baking dishes so each dinner guest has their own serving. If you choose to use one large pan, be sure that the cannelloni shells will fit together closely for optimal baking. 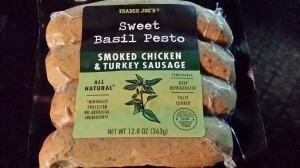 Start with some Trader Joe’s Sweet Basil Pesto Smoked Chicken and Turkey Sausage. Yes, that’s a mouthful, and it really is a tasty one. If you can’t find Trader Joe’s sausages, then use whatever else you can substitute, or make your own! 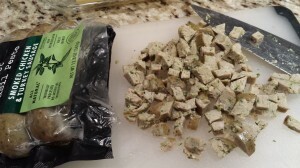 You could try an Italian chicken sausage and add some pesto when making the cannelloni filling. Finely dice the sausages, and also some onion and mushrooms. Because the sausages are so flavorful, I am using a different tomato sauce for this recipe than my usual Year Round Tomato Sauce for Pasta which is spicier than what I needed. 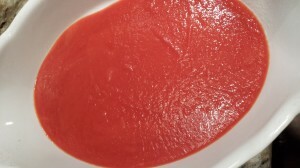 This sauce has a bit of reduced white wine and also a small amount of cream. It works well with the pesto sausages. Reduce some dry white wine in a pan for a few minutes until the alcohol has burned off. Add the tomato sauce, agave syrup, and salt and cook for a few minutes. 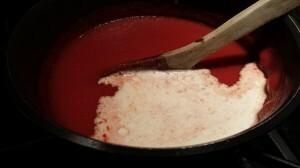 Then stir in the cream, simmer another few minutes, and remove from the heat. Then, cook the filling. In a separate pan, saute the onions, and add the sausages, and cook until the sausage pieces brown slightly. Then add the mushrooms and cook until the mushrooms have softened slightly. Remember this filling will continue to cook during the baking process. 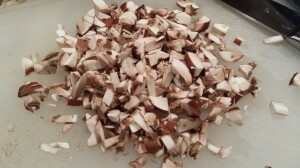 When the mushrooms are done, transfer the mixture into a bowl. 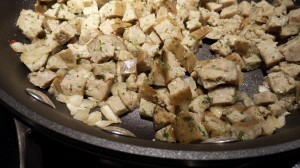 Add the cream cheese, shredded mozzarella, breadcrumbs, and Parmesan. Mix together. Fill the cannelloni shells. You can use a spoon or your clean fingers. 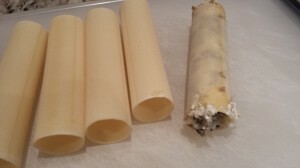 Be sure to fully stuff each cannelloni shell so the filling is evenly distributed. 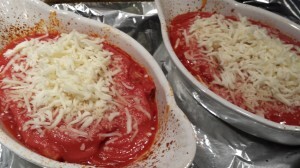 Spoon some creamy tomato sauce in the bottom of the baking dishes. 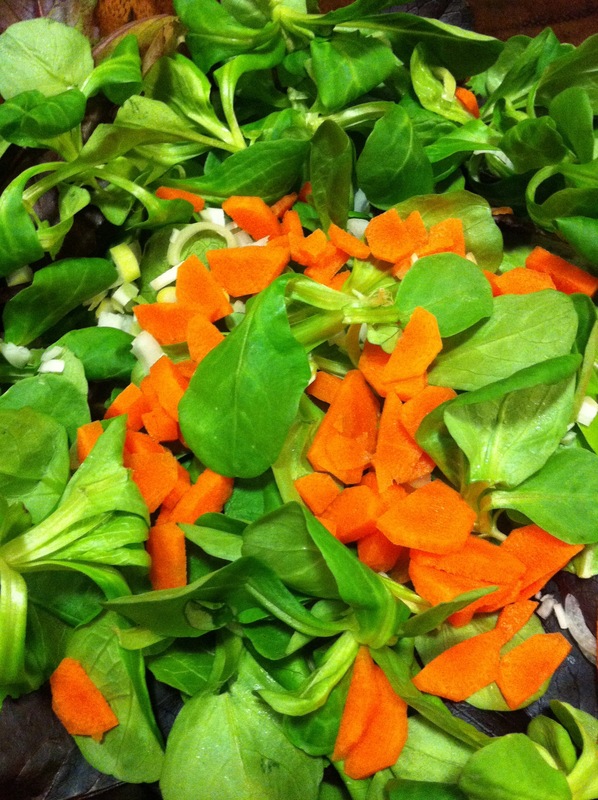 Add the cannellonis, three to an individual baking dish, or all twelve to the larger baking dish. 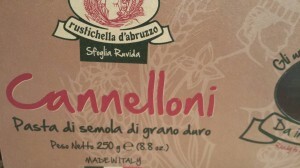 Cover the cannellonis with sauce. 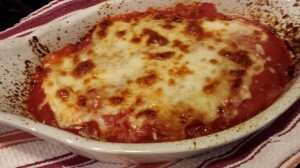 Don’t add the cheese topping yet, as you may need to “baste” the cannellonis with the tomato sauce during the baking process for even cooking of the pasta. Cover the pan(s) with foil, and bake for 40 minutes at 400 degrees Fahrenheit! 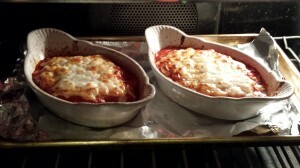 When the cannellonis are almost done, remove the foil, add some mozzarella and parmesan cheeses on top. 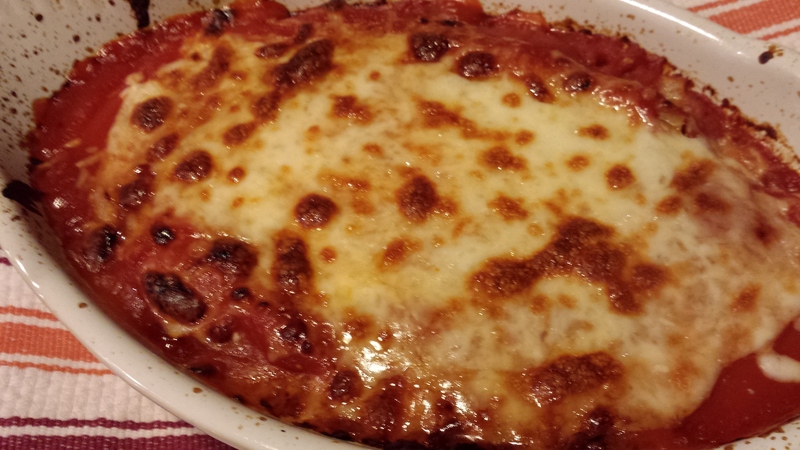 Put the cannellonis under the broiler until the cheese is brown and bubbly. Remove the cannellonis from the oven and let cool a bit before serving. I like to use folded clean thick kitchen towels on top of serving plates to absorb some of the heat from the baking dishes. 1. Preheat your oven to 400 degrees Fahrenheit. Spray cooking spray in a baking pan that is just large enough to hold all of the cannelloni shells in one layer and set aside (or use individual baking pans, three to a pan for four servings). 2. 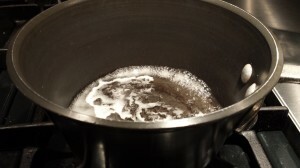 In a medium saucepan, over medium heat, bring the white wine to a boil and then simmer for 3 – 5 minutes until the alcohol has burned off. 3. Add the tomato sauce and agave syrup (or sugar) and stir. Simmer over low heat for about 10 minutes, stirring often. 4. Stir in the cream and simmer for a minute or so. 5. Remove the sauce from the heat and set aside. 6. 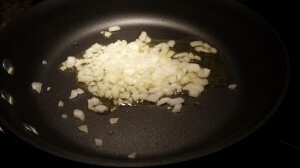 Over medium low heat, in a nonstick pan, heat the olive oil. 7. 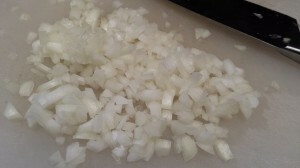 Saute the sweet onion and sausage and cook until the sausage is slightly browned. 8. Add the mushrooms and cook until the mushrooms have softened slightly. The filling will continue to cook in the oven. 9. Remove the pan from the heat and let cool slightly. 10. 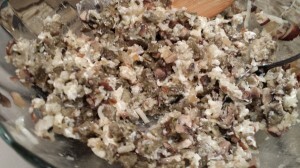 In a non-metallic bowl, add the cheeses and breadcrumbs to the sausage mushroom mixture, stirring and combining well. 11. Using your clean fingers (or a spoon), stuff the cannelloni shells. Be sure to stuff completely so there is filling in the middle of the shell. 12. 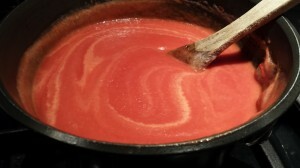 Ladle some of the creamy tomato sauce into the bottom of the pan. 13. Place the stuffed cannelloni shells into the pan, next to each other. 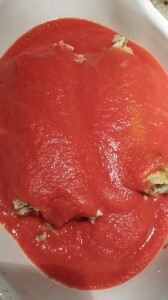 Cover the stuffed cannelloni with the remaining tomato sauce. 14. Cover the baking pan(s) with foil and bake for 40 minutes. After 40 minutes, check the pasta for doneness. You may need to “baste” the tops of the pasta during cooking. 15. When the pasta is done, remove the pan from the oven. Remove the foil, and top the pasta with the shredded mozzarella and parmesan cheeses. 16. Return the pan to the oven and broil until the cheeses melt and brown slightly. 17. Remove the pan from the oven, and let sit for a few minutes before plating. Serves 4 as a main course or 6 – 12 as a smaller pasta course. Serve with a side Caesar salad with my Hubby’s Caesar Salad Dressing and toasted garlic bread for dipping into that creamy tomato sauce. Variations: If you can’t find the Trader Joe’s sausage, use whatever sausage is similar that you like. 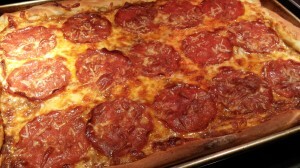 You can use fat free cheeses in the filling and as topping. Use fresh ricotta instead of cream cheese. You can omit the mushrooms. Add some finely diced bell pepper to the filling. 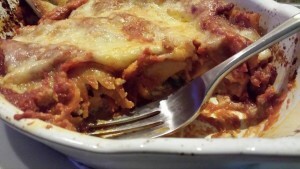 For a very decadent dish, substitute a white bechamel sauce for my creamy tomato sauce. 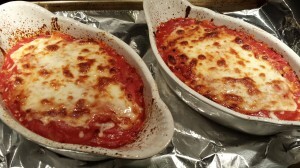 You can also use manicotti shells or even the regular giant pasta shells. Just cook according to the package directions and let cool before stuffing.